I made this dish for Jordan’s birthday, which was over two months ago (!!!) 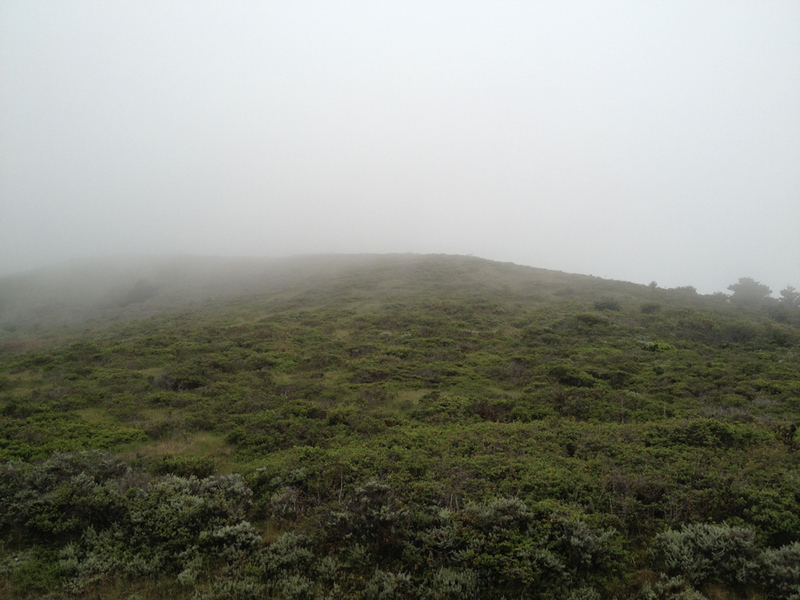 making this post terribly delayed and me a horrendous blogger. But, lamb is always good, so why not share. 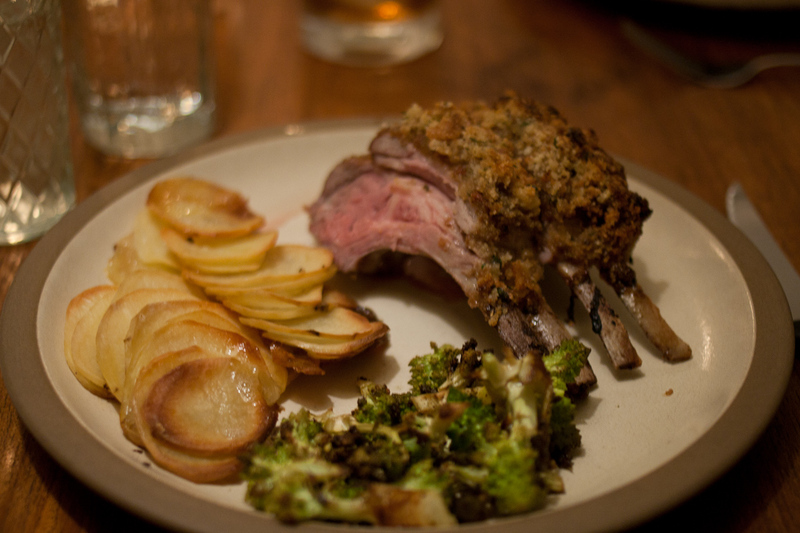 This lamb turns out beautifully. 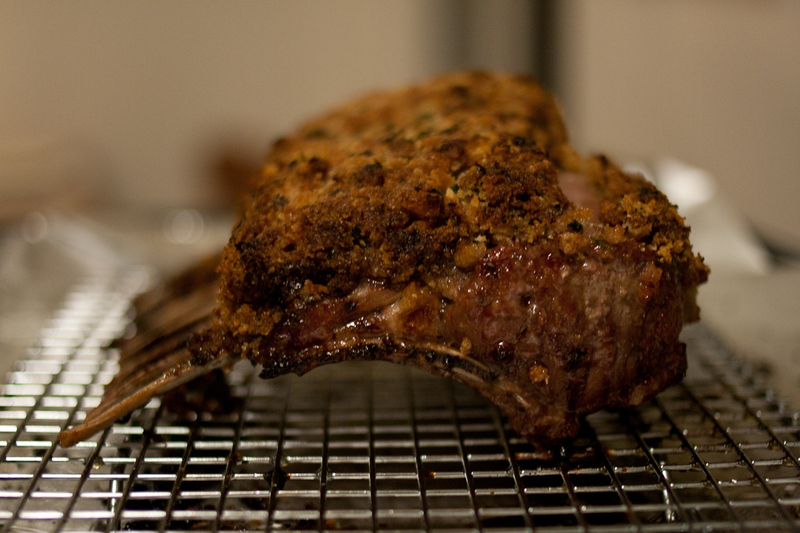 The crust is delicious and compliments the perfectly medium rare and oh so tender lamb. 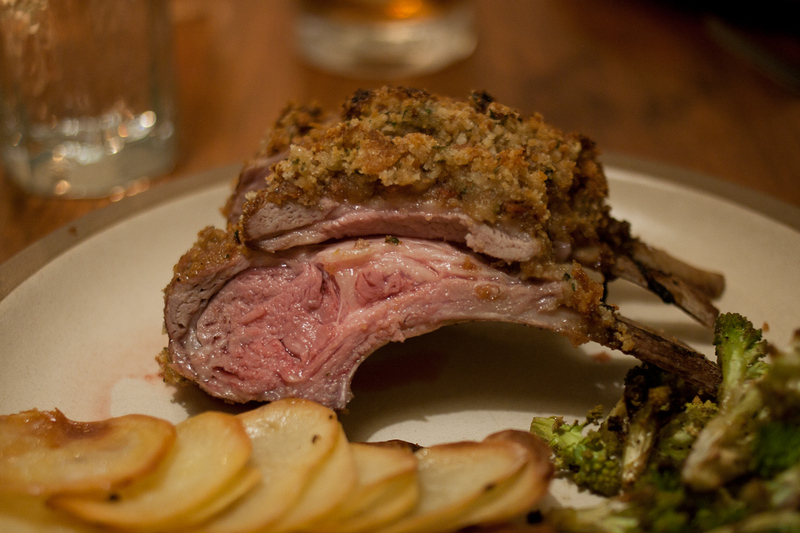 For us, this is a special occasion dish—rack of lamb is pricey. But when you love food like Jordan loves food, birthday splurges are in order. Don’t be scared off by the anchovies in the recipe. They compliment the slight gaminess of lamb and don’t add a fishy taste. 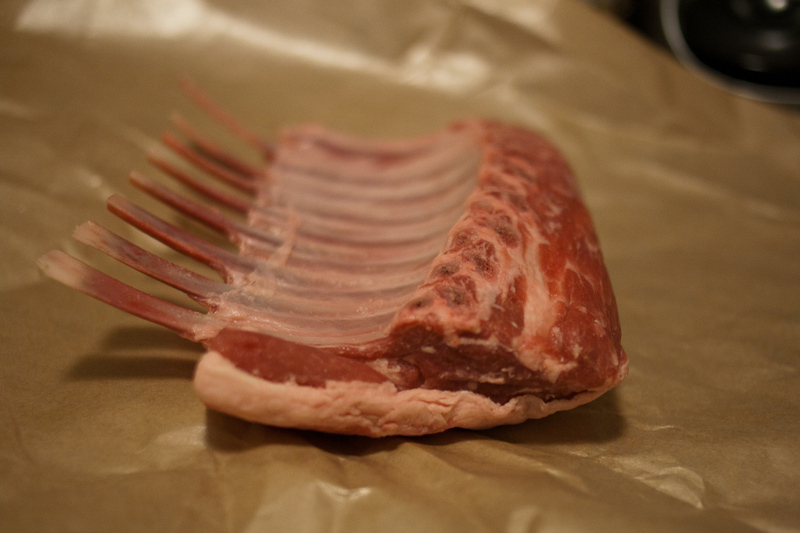 Score the fat covering the lamb in a 1/2 inch crosshatch pattern with the tip of a sharp knife. Take care to not cut into the meat. Season the rack of lamb on all sides with salt and pepper. Preheat your oven to 425 degrees and position one oven rack in the bottom third of the oven. Line a roasting pan or baking sheet with foil and set a cooling rack in the center. Heat some canola oil in a large pan over medium heat. 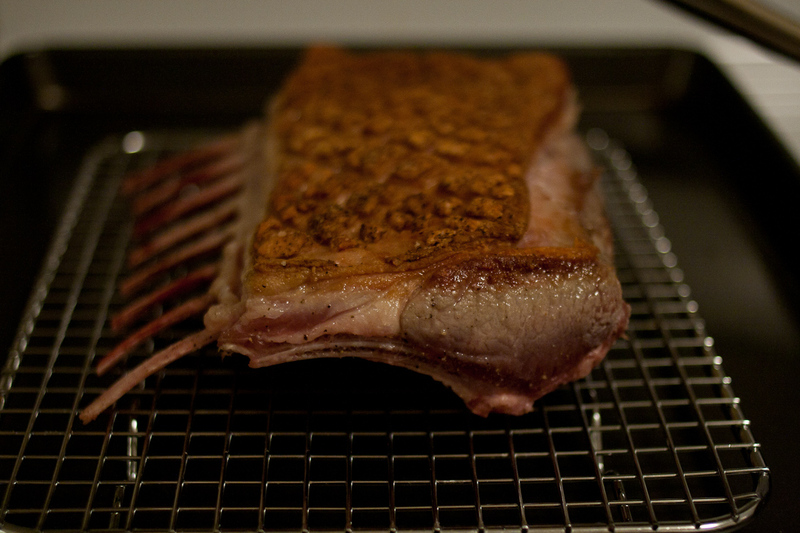 Put the lamb fat side down and sear until golden brown. Transfer the lamb to the cooling rack fat side up. Combine mustard and honey in a small bowl; set aside. Combine butter, garlic and anchovies in a food processor. Blend until smooth. Transfer the puree into a medium bowl and add the bread crumbs and herbs. Stir until just combined. Brush the fat side of the lamb with the mustard mixture. 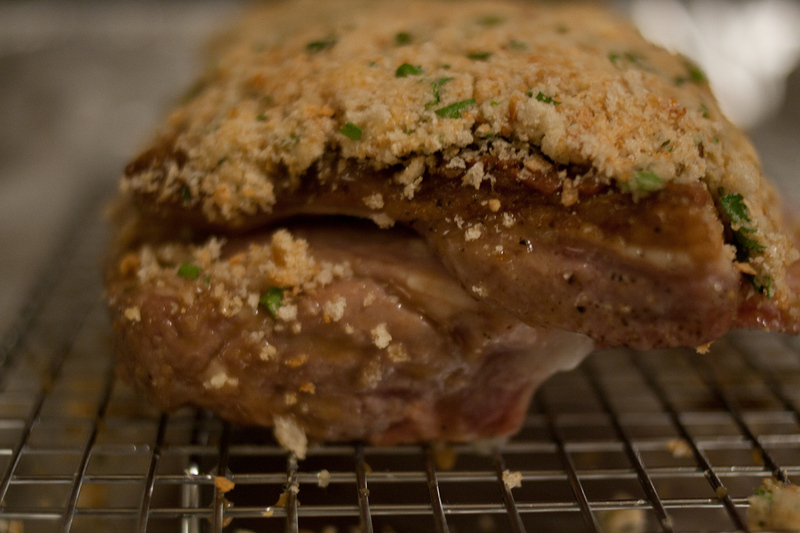 Spread the bread crumbs evenly over the lamb, pressing gently to adhere the crumbs. Put the lamb in the oven with the meat side toward the back and cook for 25-35 minutes. The internal temperature should reach 128 degrees. Let the racks rest in a warm place for 15 – 20 minutes for medium rare lamb. Carve into two bone chops and serve. I’m not really sure why these are called potatoes anna, but that is what Jordan calls them and so that is what we’ll call them here. They are his favorite way to eat potatoes and for good reason. Crispy and soft at the same time and oh so buttery—perfection in a side dish. Butter a 9 x 13 inch baking dish. Peel and slice the potatoes unto 1/4-inch thick slices. I use a mandolin to make this faster and easier. Arrange the potatoes in rows, slightly overlapping. Scatter thinly sliced pats of butter over the potatoes and season liberally with salt. Bake 35 – 45 minutes in a 425 degree oven, until parts of the potatoes are crispy and golden brown. Serve with roasted meats, sautéed fish, a fried egg, whatever protein you can get your hands on. This right here is how to make any leafy green more palatable. 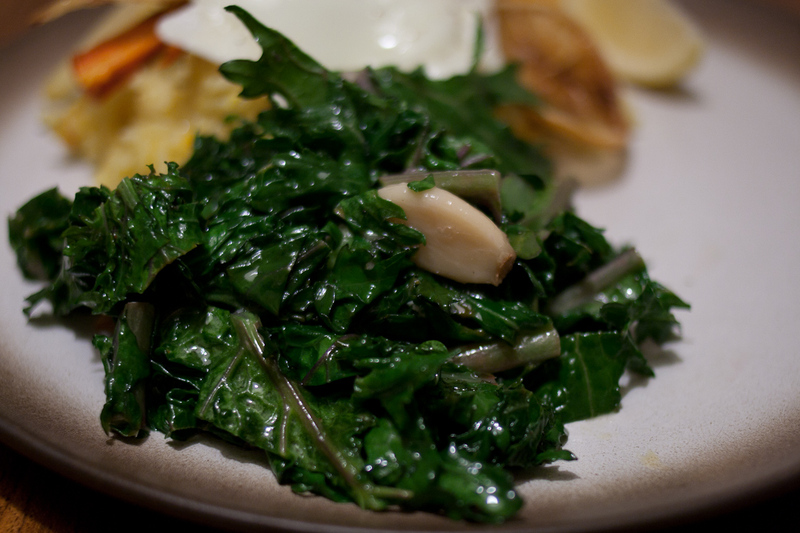 Before garlic confit, I was a very reluctant eater of cooked leafy greens. I’d pretty much avoided them since childhood—terrifying brick of spinach microwaved directly from the freezer, anyone?—and only occasionally ate them as an adult because I know they’re good for me. But since our discovery of garlic confit, I’ll happily eat them alongside any main course. Garlic confit has all the delicious flavor of garlic without the harsh bite. It’s ridiculously easy to make and delicious in pretty much anything – vegetables, pasta, mashed potatoes, spread on bread. Do yourself a favor, make a big batch, keep it in your fridge and bust it out anytime you’ve got a bunch of kale, spinach, chard, or mustard greens languishing. Because of our CSA, we usually have several bunches of greens on hand and make this once or twice a week. 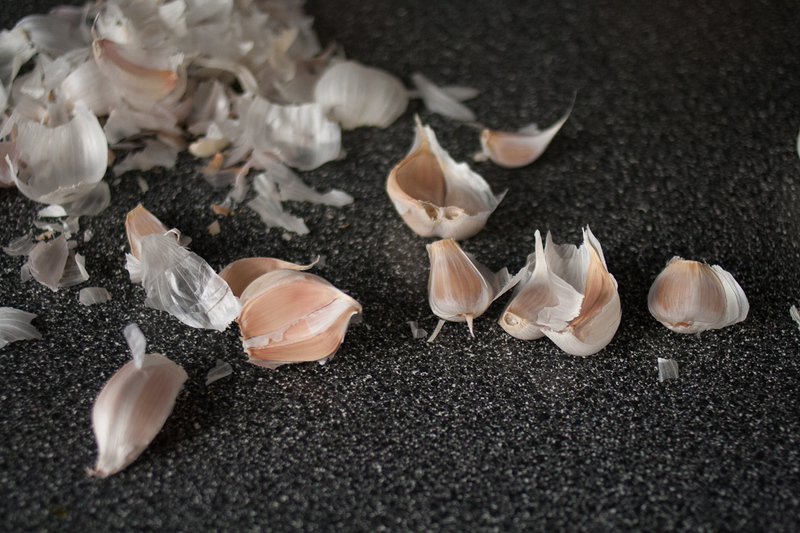 Peel the cloves of garlic and put them in a small saucepan. Cover completely with oil, about 1 cup. 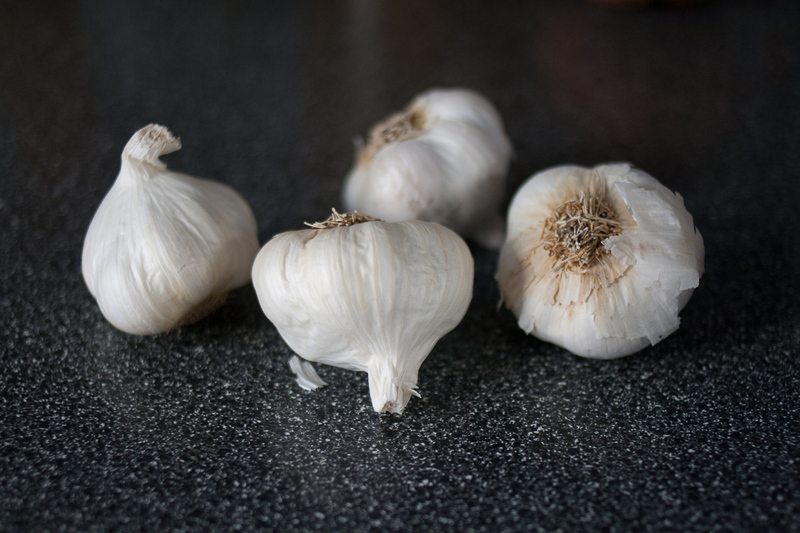 Turn the heat on to very low and let the garlic simmer for 30 minutes to 1 hour, depending on the size of the cloves. When the cloves are soft, it’s done. Pour garlic and garlic oil into a glass jar and store in the fridge. Put several cloves of garlic and some of the oil in a large saute pan. Turn the heat to medium. Add your greens and let the begin to wilt, about 2 minutes. Once they’ve released some of their water and shrunken some, use tongs to stir them around. Cook another 2 minutes and turn the heat off. Season well with salt and pepper, finish with a squeeze of lemon. 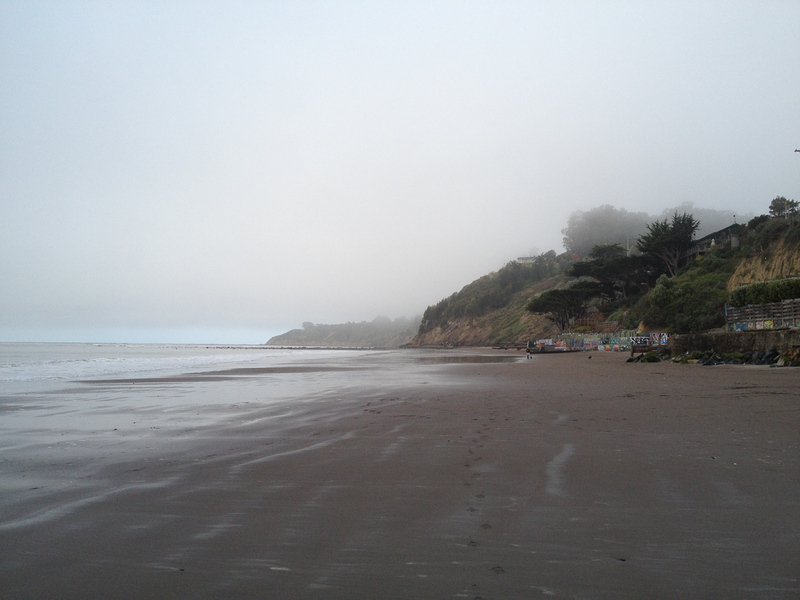 We’ve been spending quite a bit of time in Bolinas these days. 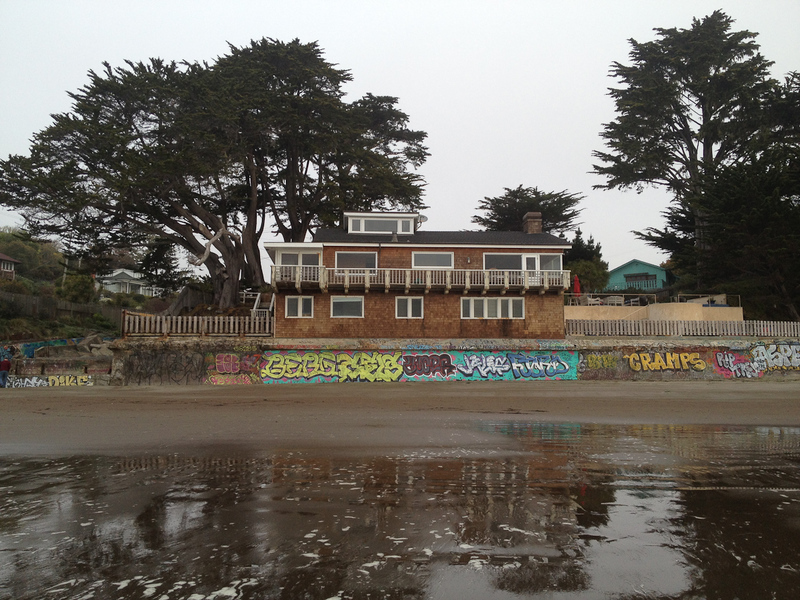 Bolinas is mellow and quiet and adorable. 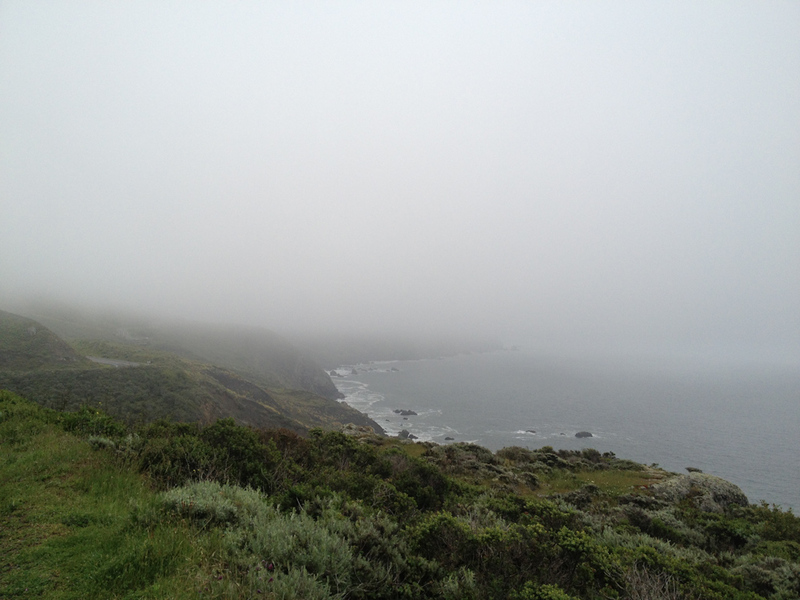 The air smells like eucalyptus, the surf is gentle, the people are friendly. It reminds me of Arnold, where my grandparents have a cabin and we spent many summers as kids, just swap the eucalyptus for redwoods. I don’t have a recipe to share, just a few photos from the weekend—though the People’s Community Market does serve a damn good chai. At the end of the spectrum opposite spelt bread, there is brioche—lest you worry our dedication to butter had wavered. For Mardi Gras a few weeks ago, our friend Kelly made an amazing King Cake. Buttery, airy, just slightly sweet, it was perfection. I enjoyed it for dessert, and then again for breakfast the next day. It took a lot of self-control to not eat Jordan’s piece while he slept. Obviously, I asked for the recipe. What I received in return was 6 pages of instructions with different classes of brioche, each with different amounts of butter and egg, and each with different baking techniques. The recipe titles were pretty great. Rich Man’s Brioche, featuring a whole pound of butter. Middle Class Brioche, a moderate 8 ounces or two sticks. And Poor Man’s Brioche, a modest 4 ounces of butter. Kelly recommended Middle Class and that is what I bring you today. This was my first time making brioche. Working with brioche dough is very different from most other bread doughs I’ve made. Because of all the butter, you shape it when it is very cold, which was much more similar to cookies than bread. The shaping was actually much easier for a first timer than a sourdough hearth bread or baguette. It gives me confidence for future croissants! Shape the dough. Line two baking sheets with parchment Coat lightly with oil. Remove the dough from the fridge and immediately shape. I was making hamburger buns so I used a pizza cutter to divide the dough into 12 equal squares. I then used my hands to roll each square into a ball. I spaced the balls evenly on each sheet, six per baking sheet. They’ll about double in size so you’ll want to keep that in mind. Coat each ball lightly with oil and cover with plastic wrap. Bake the buns for 15 – 20 minutes. They should be golden brown and 180 degrees internal temperature. Baking brioche with make your house smell like heaven. You’ll probably want to have the scent of baking brioche as a perfume and you’ll likely text that exact thing to several friends. Sit on your kitchen counter while your brioche bakes and savor it. Cool on a rack for 20 minutes before serving, or until cool before glazing. I turned half of the brioche into dessert brioche and left half plain for hamburger buns. The dessert brioche I glazed with a grapefruit glaze. I’d highly recommend it. Sift the powdered sugar into a medium bowl. Add the grapefruit zest and juice. Whisk to combine. Once the brioche buns have cooled, spoon the glaze over them. Let the glaze set. If you have extra glaze, feel free to do a second coat. The chicken pot pie of my childhood was made by Marie Callender’s. It was a personal pot pie, and it baked in the oven for what seemed like an eternity. My favorite part was the crust coated in that creamy pot pie sauce. Well, this chicken pot pie a thousand times better, though it’s a time commitment. Between making the pie crust, roasting chicken, blanching vegetables, making a bechamel, you’re in it for the long haul. But it’s worth it. I’d recommend making chicken pot pie when you have left over meat from roasting a chicken and chicken enchiladas or chicken soup don’t sound appealing. I’d also recommend it for a crowd – a single slice will fill you up. You could very easily make this ahead of time, freeze it and bake it straight from the freezer, adding 20 – 30 minutes of additional bake time. Make the pie crust the night before. In a food processor, combine flour and salt. Remove the butter from the fridge and cut into 1 inch cubes. Add them to the flour mixture. Process until the butter chunks are about the size of peas. Add the water and pulse a few times to combine. Divide into two equal balls, wrap in plastic wrap and refrigerate. Preheat your oven to 375 degrees. Remove the dough from the fridge and let it warm just slightly. Roll out the dough and place one piece in a 9 inch pie pan. Cut around the edges and put it back in the fridge. Roll out the second piece of dough into a 12 inch round. Place on a baking sheet and put it back in the fridge. Bring a pot of water to boil. Add the bay leaves, thyme and pepper corns. Salt the water until it tastes like sea water. Blanche the potatoes, carrots and onions for 8 minutes. Add the celery and cook for another two. Strain the vegetables from water, pour them onto a sheet pan and discard the spices. In a medium pan over medium heat, melt the butter. Add the flour and whisk for 2 to 3 minutes, until the mixture is light brown. Whisk in the milk. Let the sauce come to a boil to thicken, stirring often. Remove from the heat. Add the salt, pepper, thyme, parsley and cayenne. Make sure you’re happy with the seasoning. Remove the bottom crust from the fridge. Scatter the blanched vegetables, frozen peas and chicken in the pie shell. Pour the bechamel over the pie. Beat an egg in a small bowl. Moisten the rim of the shell with some of the egg. Top it with the other crust. Pinch around the edges and cut off the excess. Brush the top with the egg. Cut a small vent in the top crust to allow steam to escape. Bake on the lower rack of 375 degree oven until the crust is golden brown, 45 minutes to 1 hour. Remove the pie and let rest for 10 minutes. Cut into wedges and serve warm.